The League City Chamber of Commerce has initiated a free program to assist members in the evaluation of available Federal Hurricane Relief Tax Credits. On September 29, 2017, President Trump signed into law The Hurricane Disaster Relief Act of 2017 (H.R. 3823, Section 503). The tax relief legislation includes an employee retention credit to encourage employers affected by Hurricane Harvey to retain employees while their businesses regain normal operations. 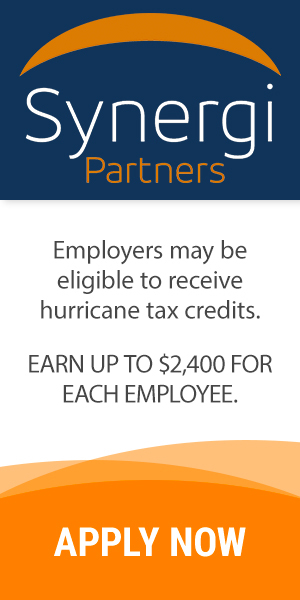 The free evaluations are being offered through Synergi Partners that evaluates tax credit eligibility for business in all affected hurricane disaster areas, which includes the entire coastal area of Texas. Synergi Partners has developed a “Operational Impact Analysis” which evaluates business revenue loss on an individual basis. The tax credit can be substantial according to Paterson. A small business with 25 employees could realize as much as $60,000 in tax credits with the amount increasing as the number of employees increase.